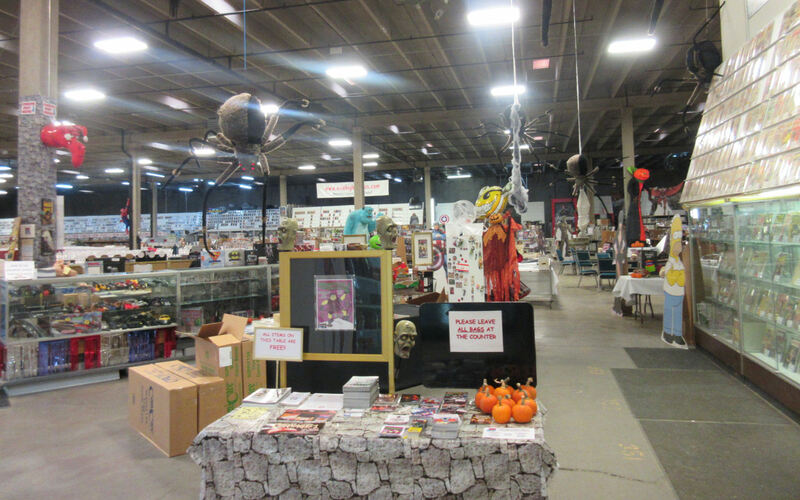 The Springs in Fall — 2015 Photos #18: Colorado Comics Cavalcade « Midlife Crisis Crossover! Captain Woodchuck, the official mascot of Mile High Comics, welcomes you to the wonderful world of graphic storytelling! But this wasn’t our usual trip. With Anne’s business matters keeping her preoccupied and frazzled, I was free to plan my one-man sightseeing as I saw fit, to drive wherever I wanted to drive, to indulge in whatever flights of fancy came to mind without any companions to bore. So when I woke up on Day Four, a Wednesday as it so happened, I had two major events coded as Priority One, and one of them was a very special out-of-town New Comic Day. 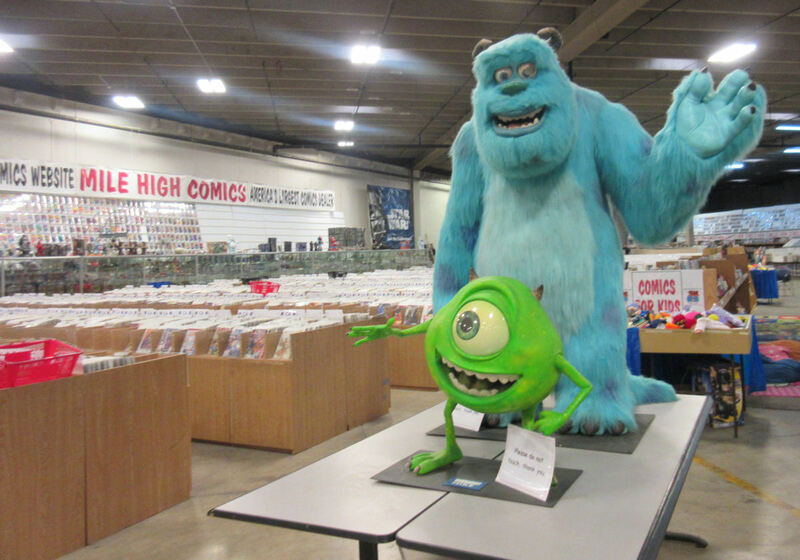 Half the day was devoted to yet another road-trip-within-a-trip, kicking off with a drive north from Colorado Springs to the much larger city of Denver, home to the largest comic shop in North America. Finding it was tricky because it’s not in a strip mall or a small-town storefront like a lot of other dealers. You have to navigate an older, clustered, cluttered, urban area and pay no attention when the road gives way to a wide open space of unmarked asphalt and hibernating semis. I found myself checking my phone every thirty seconds to make sure I was on the right track. Google Maps has lied to me before and this didn’t look like the best place to ask for directions. 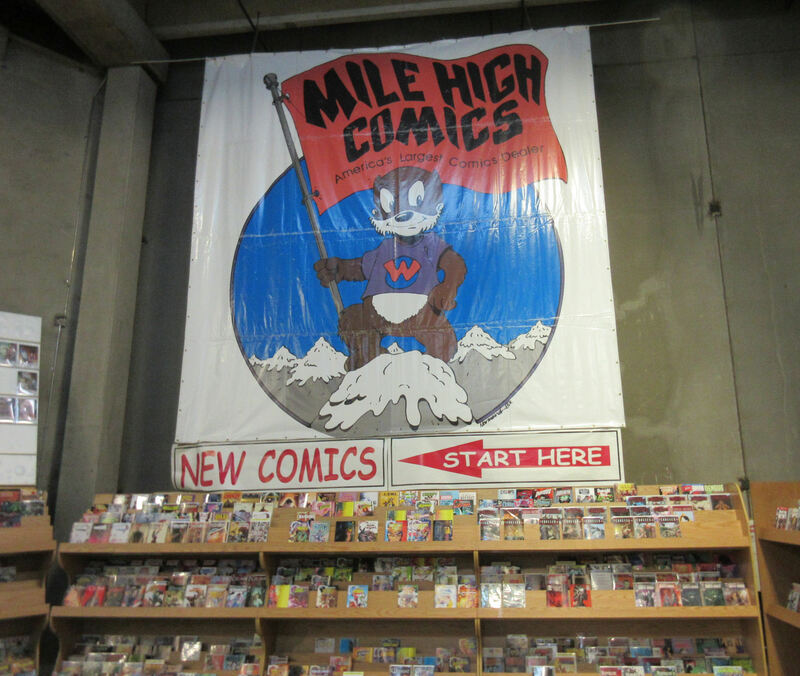 Lo and behold, there it was: famous Mile High Comics, one of the granddaddies of the comics scene. Founder Chuck Rozanski is a well-known name to older collectors who remember back in the day when he regularly bought advertising space inside various Marvel and DC comics to sell his prodigious back-issue inventory by mail order, or when he used to write a regular comics-business column for the late, lamented Comics Buyer’s Guide. I was familiar enough with Mile High that they were on my shortlist for our 2012 road trip, but didn’t make the final cut. As of November 2015 they had three locations. The biggest and broadest is literally a warehouse. Mile High: stories tall, acres wide, aisles deep. I had to park a few garage doors down to the right, then took a couple of minutes to find their spartan front door at far left. Abandon funds, ye who enter here. Enter: wonderland. 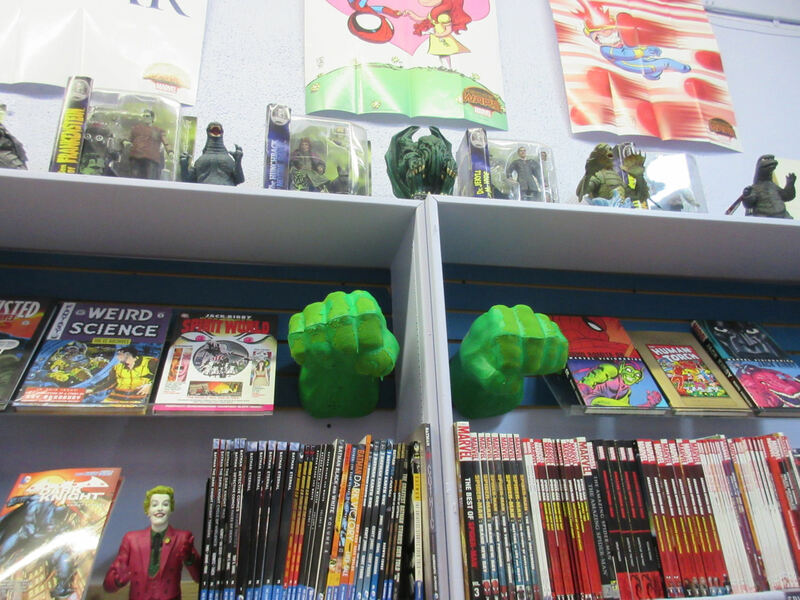 Millions of comics, graphic novels, books, magazines, toys, licensing tie-in products, and more more more. This being November 4th, a few Halloween decorations were still hanging around. Note the table full of freebies front and center. At left: manga! At right: Avengers standees! Far in the back: the cordoned, employees-only area where they store their older, rarer issues. Quite a few areas and displays were welcoming to younger readers, not just us old guys. I’m not sure li’l Billy would enjoy the back-issue boxes. 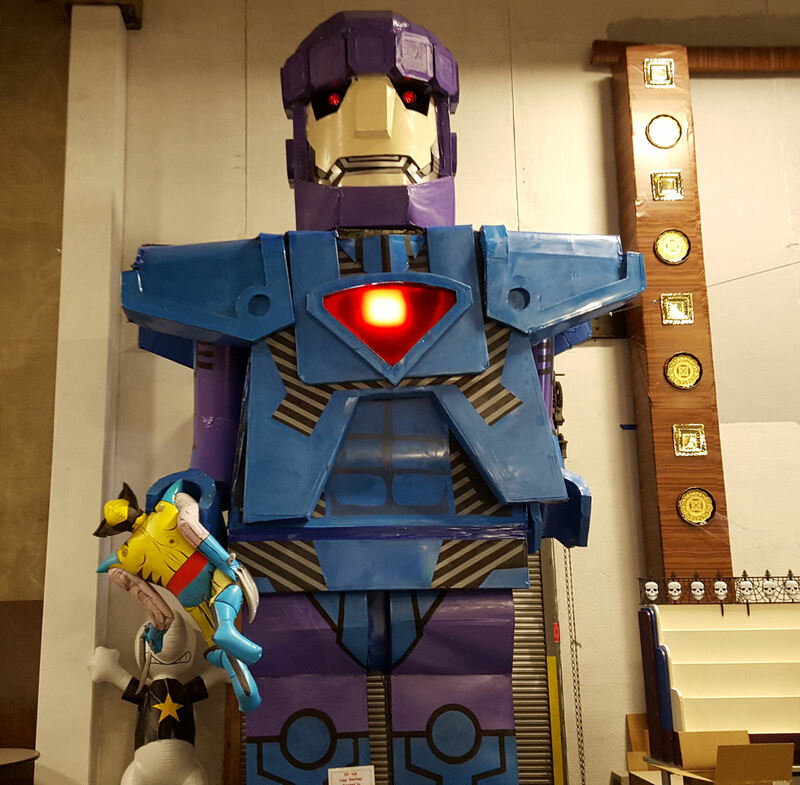 That super-sized Lego Sentinel, though. Little did I know the warehouse was packed more than it had been previously. The following week, Rozanski announced to the press he’d been moving stock there from his second-largest location with the intent to put the latter up for sale because, thanks to a combination of legalized marijuana use and firm laws against outdoor marijuana crops, vast warehouse spaces are doing booming business on the local real estate market as demand has surged from the burgeoning pot-farming industry. Rozanski’s plan to consolidate his operations should net him a pretty penny once the right buyer comes along. As of this writing that warehouse can be yours…for a price. Major caveat for the unfamiliar: as with their mail-order business, Mile High is not a place for clearance sales or 3-for-$1 boxes. Anything more than a few months old is assiduously priced for collectors willing to pay above cover price to find those vintage rarities or just to fill gaps in a recent beloved series. I could’ve spent all day there browsing from shelf to shelf to shelf to shelf to shelf, but (a) I had other things I wanted to do with my day, and (b) the Great Hard Drive Crash of July 2015 wiped out my long-standing want list, so now I have virtually no idea what back issues I’m missing, and I’ve yet to get into the mood to redo a full inventory on those fifty-one longboxes sitting in our library. So my primary objective was new comics only. This was the first week of the month, which means heavy shipments of new stuff from the major publishers. Of the hundreds of new issues out this week, my list had fourteen comics I was either reading regularly or considering trying out for the occasion. Mile High opens earlier in the morning than our shops do back home, so I’d hoped to get there early enough to beat our the other buyers for this week’s new issues. Final haul: Angel & Faith #20, James Bond 007: Vargr #1, We Stand on Guard #5, Dr. Strange #2, Hercules #1, and Star Wars #11. I was surprised to find nearly half my list either sold out on Day 1, set aside behind the counter for regular customers, or simply not ordered in the first place. 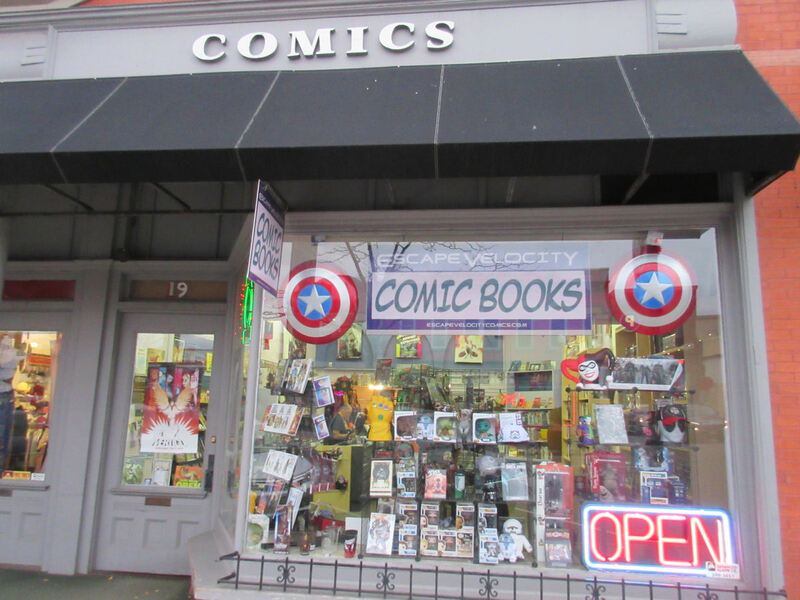 For a place touted as America’s Largest Comics Dealer, that’s, um, kind of disappointing. After lunch I wandered in a direction recommended to me by a local friend who thought I might be interested. That led me to Shop #2: All in a Dream. 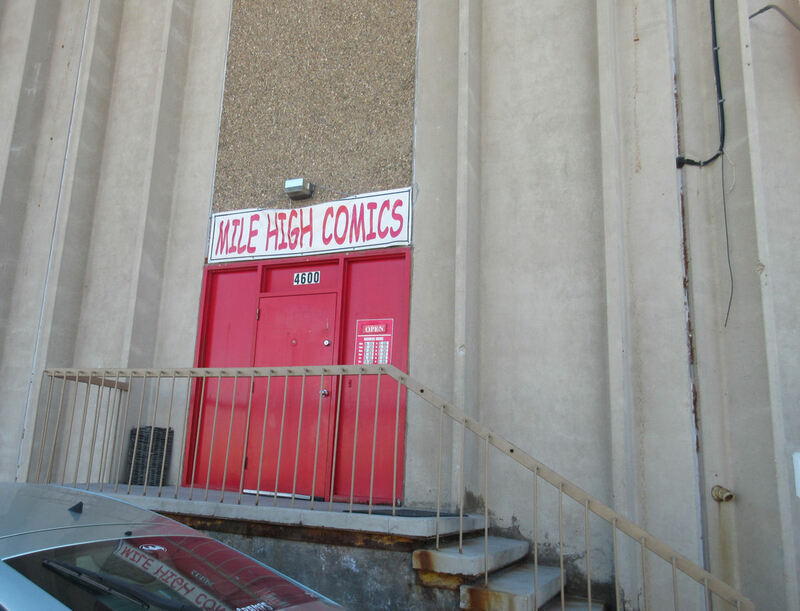 I’m guessing this location isn’t much younger than Mile High Comics. 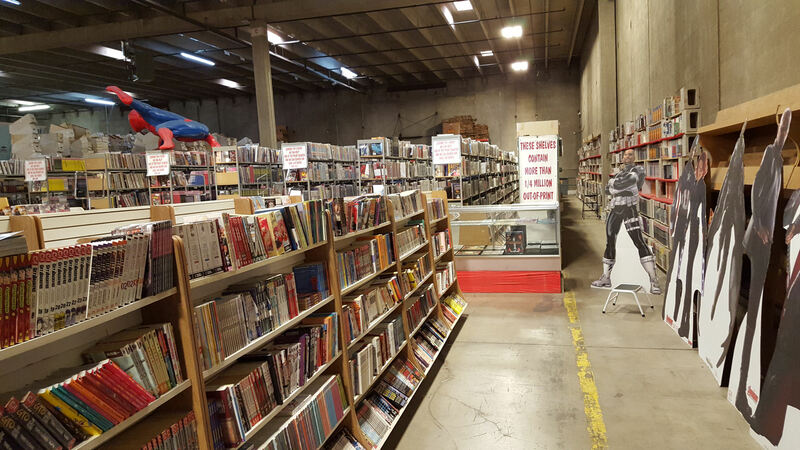 Inside was a labyrinth of dozens of boxes and bookshelves full of graphic novels and old sci-fi paperbacks. Paths of threadbare-to-disintegrating carpets wind around the outer perimeter, with wire racks in the back for recent comics and that day’s new arrivals laid out across the back-issue bins in accordance with the traditions upheld by older retailers. Final haul: Unfollow #1, Paper Girls #2, this year’s second Howard the Duck #1, and an Optic Nerve #11 plucked from a stack of multiple copies still on the new-release rack years after the fact. I can’t recall if the shopkeeper said hi when I first entered. When he rung me up, we spoke briefly only to agree neither of us remembered any papergirls in our respective neighborhoods way back when. Truth be known, I wouldn’t say I wasn’t the most in-touch kid on my block, so for all I know we could’ve had dozens. Not really a hill for me to die on. Apparently I got off light compared to the Yelp reviewers who’ve amassed quite a collection of cautionary tales about the place. I’ll leave you to explore those reports at your discretion, though it seems the store is so frequently opened or locked up on random whims that as of tonight Google+ thinks it’s permanently closed despite one review from a month ago insisting otherwise. Later in the day I returned to Colorado Springs and spent some time traipsing around their downtown, angling my way toward stop #3: Escape Velocity Comics. Pretty sure it was the youngest and smallest of the three stores. Didn’t matter. 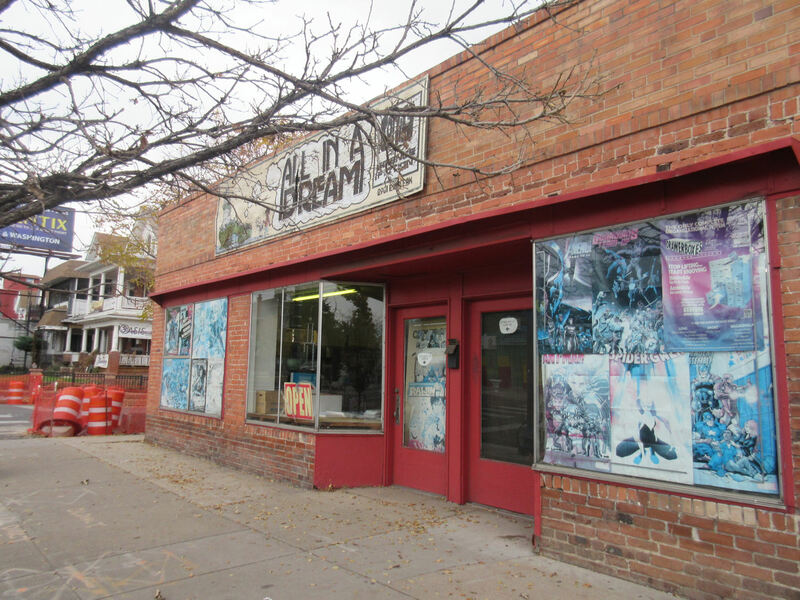 I chose it for two reasons: it was near other things I wanted to see; and, of all the shops in Colorado Springs, theirs had the nicest website, complete with pics of what appears to be a younger, fun-loving staff. BUY COMICS OR HULK SMASH! Their selection was above-adequate, and the general ambiance read “actual customer service” to me. Other than a stubborn, not-quite-state-of-the-art credit-card machine that slowed me up at the register, Escape Velocity felt like the kind of place I’d be happy to shop regularly if I were a local, or if we had the chance for more discounted Colorado trips in the future. If only. Final haul: Survivors Club #2, Invincible Iron Man #3, and Atomic Robo and the Ring of Fire #3. I’d’ve bought more if I hadn’t stopped at two other stores first.